Nokia E71 Blog For Fanatics: Introducing The Nokia E75 - A Worthy Contender To The E71? Introducing The Nokia E75 - A Worthy Contender To The E71? Have you heard the big news? N-Gage is finally coming to the Eseries! That's only on the upcoming devices, like the beautiful new Nokia E75. If you haven't seen the pics of the E75 yet, then you're missing out. Cuz this thing looks damn good. From the front it looks like a basic candybar phone with T9 input. Nothing wrong with that right? It includes a full qwerty keypad. You would think it's gonna be too big and bulky but the size is 111.8mm x 50mm x 14.4mm, with a QVGA screen that measures in at 2.4-inches. Not something to cry about at all. 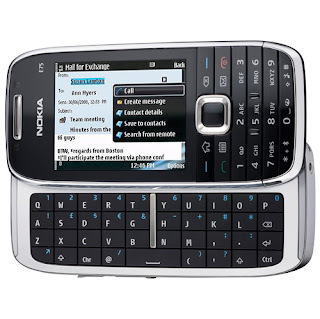 The Nokia E75 also comes loaded with the new Nokia Messaging service for slick email and HTML email support. Plus it’s packing a 3.2 megapixel camera with autofocus, high speed HSDPA access, integrated A-GPS with Nokia Maps, and a music player with a 3.5mm standard audio connector. 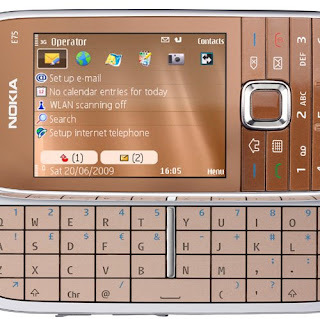 The Nokia E75 comes in black, red, and copper. In my opinion the copper is going to be a huge hit since it's so unique. How often do you see a copper colored business device? Is this the device something that I'd upgrade to? Hmmm, I don't think so. One of the HUGE reasons I love the E71 is the astonishing battery life. The E75 has a 1000 mAh battery, compared to the E71's massive 1500mAh battery. Really can't compare, especially when you want to tether and check email all day, for many days. 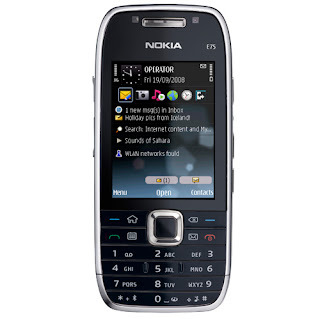 What do you think about the new Nokia E75? Would it be a worthy upgrade to your precious E71?